This day-long pre-conference session will guide participants through various exercises and meditations that help us become at ease with discomfort and enhance our ability to respect and deeply value all aspects of ourselves, other people and the world around us. The session will support participants’ capacity to self-reflect on biases and judgments held against the self, others, and the world. There will be exercises that allow participants to notice harshness as a hindrance to growth, particularly in educational contexts. For example, participants will have an opportunity to reflect on early school and learning experiences and consider how their internalized messages about education have impacted the way they teach and learn in the world now. Practical meditations that teach participants how to “catch and release” biased or judgmental thoughts will also be taught. The session will include sitting, movement and outdoor exercises that encourage participants to embrace discomfort and transmute it into wisdom, allowing access to greater internal and external freedom. Registration for the Pre-Conference Retreat Day is available as an add-on to your Main Conference registration. You can also register for the Pre-Conference separately from the Main Conference. Dr. Kamilah Majied is a mental health clinician, clinical educator, researcher, author and international consultant on the impact of oppression on mental health and social functioning. Her scholarship focuses on racism, sexism, homophobia, heterosexism and other forms of social oppression. Dr. Majied has conducted research and presented on mental health, social development and education in various parts of the world including Japan, Trinidad, Iceland, the Bahamas, Copenhagen, Jamaica, Switzerland, the United Kingdom, South Africa, Egypt, Haiti, Gambia and Cuba. As a consultant, she works to make health and human service organizations more culturally competent. 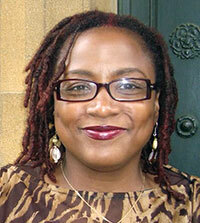 Dr. Majied is an Associate Professor of Social Work at Howard University. She has successfully assisted various University-based, national and international entities in developing programming that welcomes and supports diversity, addresses disparities and advances organizational and community wellness. Dr. Majied has been a practicing Buddhist for 36 years. She has taught domestically and internationally about mindfulness-based cognitive therapy, mindfulness and racial justice, Buddhism and mental health, mindfulness practices as a path towards preserving the environment and contemplative practices in education. She serves on the editorial board of the Journal of Religion and Spirituality in Social Work and is Co-Editor of a special issue on Peace, Reconciliation and Non- Violent Conflict Resolution. Dr. Majied gave opening remarks at the first White House Conference of Buddhist Leaders on Climate Change and Racial Justice, where she also facilitated the dialogue on ending racism amongst the internationally represented Buddhist leadership. She is one of the original authors of the Buddhist People of Color Statement Calling for Racial Justice published by Lion’s Roar magazine. Dr. Majied serves as facilitator for the North American Buddhist Alliance’s ongoing dialogues on Buddhism, mindfulness practices and social justice. A member of the Association of the Contemplative Mind in Higher Education, Dr. Majied employs contemplative pedagogy and mindfulness practices in both clinical practice and education. Registration for the Pre-Conference Retreat Day is available as an add-on to your Main Conference registration or as a separate, stand-alone registration (see links below). Rates are $25 for students and $100 for everyone else. Financial aid is available through the ACMHE Conference Access Grants. All pre-conference registrations provide access to the event only: lodging and meals are NOT included (although beverages and light snacks will be available throughout the event). Learn more about lodging and dining. This is a special pre-conference rate for graduate and undergraduate students.